Is it a fantasy or a reality? Is it a dream holiday or an adventure destination? Is it a display of natural beauty or a canvas for ancient art? Is it a wilderness park or a cattle station? Is it a drover’s dream or a killer’s crime scene? Yes–it is all of these and much more. It is more than you could imagine. In The El Questro Story, Meg Hornabrook shares the rich history of north-west Western Australia, the Kimberley and the pioneers who opened access to it, and the people who gave to the world one of the jewels of the Kimberley – El Questro Station and Wilderness Park. This extraordinary place has a past that is even more fascinating than its present, full of humour, adventure and drama. The El Questro Story has it all. The El Questro Story is an Australian story. "El Questro resort and cattle station – a high profile tourist destination – is situated west of Kununurra and accessed via the Gibb River Road. Occupying 1,000,000 acres of pastoral lease, it encompasses the Cockburn Range, part of the Durack Range, and sections of the Pentecost, Chamberlain, Salmond and King rivers. Magnificent scenery abounds, and The El Questro Story begins with magnificent colour photographs and an explanation of the station’s landscape and geological features. Brief chapters titled ‘Human Migration’, ‘Rock Art’ and ‘Early Exploration’ follow. Having thus set the scene, Meg Hornabrook then moves into detailed coverage of her favourite piece of country, the place in which she enjoyed eleven treasured seasons working as a ranger. The book grew out of a manual of information that Meg created for her work as a ranger. Pages 51 to 140 document the exploration, speculative leasing, and land use that preceded the creation of El Questro Station in the late 1950s. Here we read about the Durack expedition (1882), the arrival of cattle in the East Kimberley (1885), the establishment of Wyndham and Halls Creek (1886), and further exploration by Joseph Bradshaw (1891) and F. S. Brockman (1901). The Wyndham meatworks (1919), transportation, and stock routes are discussed, with a handy sketch map of early roads, tracks and stock routes provided by John McMicking. Segments of his recollections are included to show how the Gibb River Road came into being and which stations it served. Prior to the construction of the eastern end of the Gibb River Road, pastoral leaseholders on the land that eventually became part of El Questro used tracks or the stock route for their access. Some of those people are discussed in the book, the most memorable name being that of one of the earliest – George James Williams – who was known as “Cockitup” and “The Mountain Devil”. 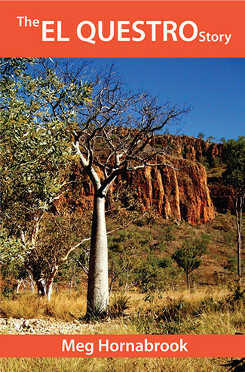 Pages 141 to 256 cover El Questro Station, with another batch of great photographs. In this section, Meg Hornabrook documents ownership, use, and development, starting with the lease application lodged by Charles Torrance MacMicking in 1958. Known as Torrance or Torry, he was the older brother of John McMicking for whom an obituary appears in this newsletter. Readers interested in stations and tourism will appreciate the detailed account of one of the East Kimberley’s stellar successes. Told by someone who sought information from books, archives and people who preceded her at El Questro, it gives an informative and balanced overview of fifty years of development and change. The book is rounded off with general information that includes bird sightings, origins of placenames, and a chronology for the station." "I am filled with admiration for the research gone into The El Questro Story and the way Meg has brought so many threads together to make this wonderfully informative whole. It is as well, since I imagine there will be many newcomers to the land and its history, that she has started way back with the genesis and human migration section in excellent summary. Anyone familiar with searching through Kimberley land-titles will know what tangled lines emerge, and El Questro is certainly a fine example. But the author seems to have doggedly gone down every track and come up with a most comprehensive picture, full of interesting characters and events along the way. The country itself is comes to life through her own close knowledge and love of it. The photos are excellent – maps, gorgeous scenery and old vehicles all finding a place – right through to birds, place names and the chronology of the property – nothing missed - and it would be hard to come up with a question she hasn't somewhere answered. I can only congratulate Meg on this achievement, the culmination of long years of hard work. It fills in many pieces of the great Kimberley jig-saw puzzle and will be a most valuable reference book as well as a damn good read. My family made a living wading through rivers of blood and that for me always underlies the great pioneering and heroic aspects of the Durack enterprise. It was after all, just a commercial venture, as were all such in the Kimberley. So the emergence of El Questro as a wilderness area is the best outcome that could be hoped for." © Shop Front Builder. All Rights Reserved.